Infinity Pools by International Swimming Pools Inc.
Don’t see your shape or size? We can customize your pool with sundecks, kiddie areas, benches and more! For more information on the shapes and sizes of inground pools available to you, feel free visit manufacturers’ websites. 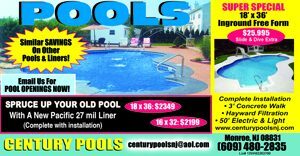 For help with your Inground Pool, please contact Century Pools at 609-259-6169 or fill out our FREE Online Quote Form on the left side of the page. You can also visit us at our new Showroom Location,click here for directions.